L-Arginine and nitric oxide connection is especially appealing for people seeking to increase their fitness levels, build stronger and leaner muscles. L-Arginine amino acid also triggers nitric oxide formation, helps keep blood vessels dilated and improves blood circulation. Nitric oxide side effects occur when the concentration of this important substance is higher than normal, which in turn triggers beneficial nitric oxide to transform into a strong nitrogen free radical. In case you suspect any of these conditions, nitric oxide side effects could manifest themselves in mild to severe indigestion symptoms, headaches, fatigue, severe allergic reactions and tremors. 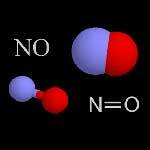 Extreme nitric oxide side effects could be so serious they might require immediate hospitalization. L-Arginine and nitric oxide can interfere with the use of some medications, namely, non-steroid anti-inflammatory drugs, Lysine and some potassium altering medicines. To avoid major nitric oxide side effects, always talk to your doctor before initiating any supplement therapy.